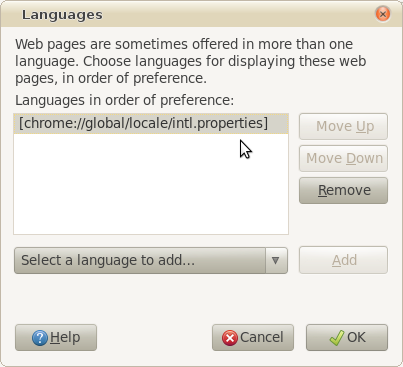 What language is 'chr' and why is my homepage set there? For reasons I can't fathom, my Google searches keep ending up at http://www.google.com/webhp?hl=chr. What language is 'chr' (I don't know why I can't find this by searching Google, but I can't)? More importantly, how do I stop it? Edit: It's a bug in Firefox. Whoa, those are crazy letters! I think Alex is right about the Cherokee language. If you want to force your browser's homepage to show Google in English, you will have to set your homepage to google.com/ncr in your browser's settings. Edit: Google probably determines which default UI language to show based on your IP address. Your IP address probably geo-locates to a place where Cherokee is used by most of the people. For example, I am located in Korea, and I always get the Korean version of Google. However, if I set the Google settings to use the English UI, it uses English for that computer/browser. This requires browser cookies; do you have cookies enabled? Also, if your browser explicitly sets your homepage to http://www.google.com/webhp?hl=chr then Google will dutifully display Cherokee. Firefox must be seeing "chrome" and reading "chr" = cherokee. Removing that line fixed the problem. I've recently turned on Firefox sync, Xmarks (installed in both Firefox and Chrome) and Chrome sync, so I suspect one of them has done this by mistake. Funny! Just follow this detailed tutorial on making Google your Homepage .If it doesn't work replace google.com with google.com/ncr ,that must work. What are the differences between localized and encrypted Google search?